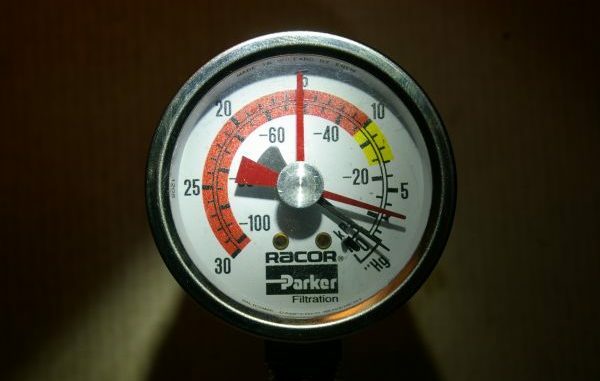 A wise man once told me that the visual type of pressure gauge used on Racor filters were nothing but junk. This man lives lives in Vero Beach, FL and regularly teaches classes on such things;-) Well unfortunately I had just bought and installed those devices and all was fine until last weekend…..Though I had checked the gauges, as I religiously do before and after each run, we were running at 80% load for about 30 minutes when suddenly the port engine dropped to idle rpm. I immediately checked the gauges and I suspected the filters had clogged and again I saw no difference in the display. Just junk… I now have proper Parker gauges with needles. Well, at least he didn’t call me a wise OLD man…. 🙂 Thanks Marty. Glad we could help! And if YOU want to join us for a seminar or two learn more here and register today!